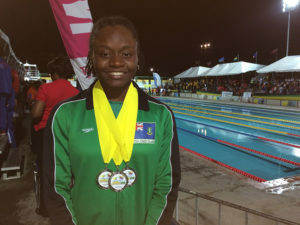 Elinah Phillip bagged her third silver medal at the 33rd Carifta Games Swimming Championships in Kingston, Jamaica on Tuesday night, to mark her 18th birthday and became the BVI’s most prolific Carifta Games athlete in track and field or swimming, ending her illustrious career with 10 medals. Her three silver medals was just shy of the four she won in 2014 including two gold medals. Phillip began with a silver medal in the 50m Butterfly, with a second place finish in the heats in 28.17 second, then match the same position in the final, with 28.29. She followed up with a second place finish in her 100m Freestyle heat, covering the course in 59.17 seconds, then went better in the final with 58.98—just off her 58.93 personal best—to secure another silver. On her 18th birthday, she climbed out the pool with another silver medal, after placing second in the 50m Freestyle in with a time of 26.29 seconds, after 26.45 in the prelims, where she was also second. It was also Phillip’s first time competing on her birthday. “This is new new to me because I’ve never competed on it before, so it was a pretty good birthday present,” she said. With her Carifta Games career coming to an end, Phillip offered advice to anyone trying to emulate the standard she has established as the benchmark. Her message is for them to be themselves and work hard to achieve their goals. “If you aspire to be better than anybody else, then you can be the best you truly can be,” she said. Since her 2014 debut when she made a splash with two golds a silver and a bronze medal, Phillip had a bronze in 2015. She skipped the 2016 championships to focus on the Rio Olympic Games. She earned two silver medals last year before her three silver medals this year bringing her total to 10, surpassing Chantel Malone’s seven individual medals from track and field. Keita Cline has won the most Carifta Games medals among males with six, including four gold.